The men always had their hunting hats all decorated when they did their ceremonies, and the women wore something on their heads like this. They danced wearing these. This woman’s hat was worn for dancing during celebrations at the end of the fur seal harvest and on other special occasions, such as weddings. The red and black strips on the top are painted seal esophagus, and the white stitching is caribou hair. 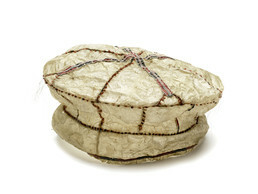 Round embroidered caps made of sea mammal intestine first became popular in the early nineteenth century and were based on the shape of a Russian sailor’s hat. They were sometimes worn as waterproof covers for cloth caps underneath. Mary Bourdukofsky: That’s women’s ceremonial hat. Aron Crowell: How can you tell it’s a woman’s hat? Mary Bourdukofsky: Because as I was growing up, I saw pictures. The men always had their hunting hats all decorated when they do their ceremonial things, and the women wore something on their heads like this. They dance around wearing these. Maria Turnpaugh: That sounds Russian. Daria Dirks: Is this a Russian style hat or Aleut design? Maria Turnpaugh: It looks like a Russian style. Mary Bourdukofsky: Yes, Russian. I made a similar one from felt. The Aleuts wore these, [made from] gut and esophagus of the seal. Daria Dirks: Was it that on top? Mary Bourdukofsky: It looks like feathers. It’s too stiff for feathers. It could be hair. Vlass Shabolin: Reindeer hair or something like that. Maria Turnpaugh: It’s kind of stiff. Mary Bourdukofsky: Where it’s from? Mary Bourdukofsky: Unalaska don’t have reindeer. Maria Turnpaugh: Maybe it’s fox. Maria Turnpaugh: Now that [along narrow strips at top] is a kind of stitch I’ve seen a lot of, like a buttonhole stitch. Mary Bourdukofsky: And that trim again. It seems like they put that ribbon inside and then went over with the last stitch. See, right here [side]? I remember mom put ribbon in her sewing to make it colored. She had red, black and white ribbon. Maria Turnpaugh: But how could they get ribbon that narrow? Mary Bourdukofsky: You fold it, and you fold it again. That’s what mom used to do. Maria Turnpaugh: A French seam they call it. Look at this trim [along wide strips at top]. Maria Turnpaugh: Yes, it’s got little tiny chain stitch through there. This bottom stitch here is what gets me [stitching at brim]. Look at how fine that white little chain stitch is. The needles they must have had were very small, because that is hard to sew. So fragile. Aron Crowell: What did you learn or what did you hear, growing up, about the ceremonies that people used to have? Mary Bourdukofsky: I think my dad said, after a big hunt, when the season’s over, that’s what they celebrate. The government let them slaughter so many seals, and the season was over after two months in August. Then after it’s packed and ready to go to the Lower-48, then they have a big celebration. Their hard work is done. Maria Turnpaugh: But we don’t have that in our times. I’ve heard of after weddings, big occasions like that. They’d celebrate weddings for three days. Mary Bourdukofsky: On St. Paul they do. Aron Crowell: Do you remember hearing about the kinds of ceremonies the people had before the Russians came, with masks and drumming? Maria Turnpaugh: On the nineteenth, yes, Christchuniya. And they have masquerading three days before that, dressing up in different kind of costumes. They say they’re trying to find the devil or something. Aron Crowell: Does this hat connect to Assqeenogthen or any of those ceremonies? Mary Bourdukofsky: I think it might connect to the celebration before the nineteenth. Aron Crowell: And maybe also with the hunting. Mary Bourdukofsky: End of seasons, yes. 1. Slapkun [fancy women’s hat] comes from the Russian word shápka [cap, hat]. 2. In the Russian Orthodox religion, Christchuniya [Epiphany] is on January 19th and celebrates the day that Jesus was baptized. The decorative strips on the top of this intestine cap are made of red and black-painted seal esophagus. The white stitching is probably caribou hair, although mountain goat, sheep, and human hair were also used by Unangax^ seamstresses. (5) In the 20th century, colored ribbon was substituted for esophagus, as Mary Bourdukovsky and Maria Turnpaugh described.